This Picture of the Week is a special treat: a first-light image from the newest resident of ESO’s Paranal Observatory, the SPECULOOS Southern Observatory. This planet-hunting machine aims to observe nearby but dim stars to locate exoplanets for other telescopes — such as ESO’s forthcoming Extremely Large Telescope (ELT) — to study in detail. Comprising four one-metre telescopes, each named after one of Jupiter’s Galilean moons, SPECULOOS promises to open up new frontiers in exoplanet research. 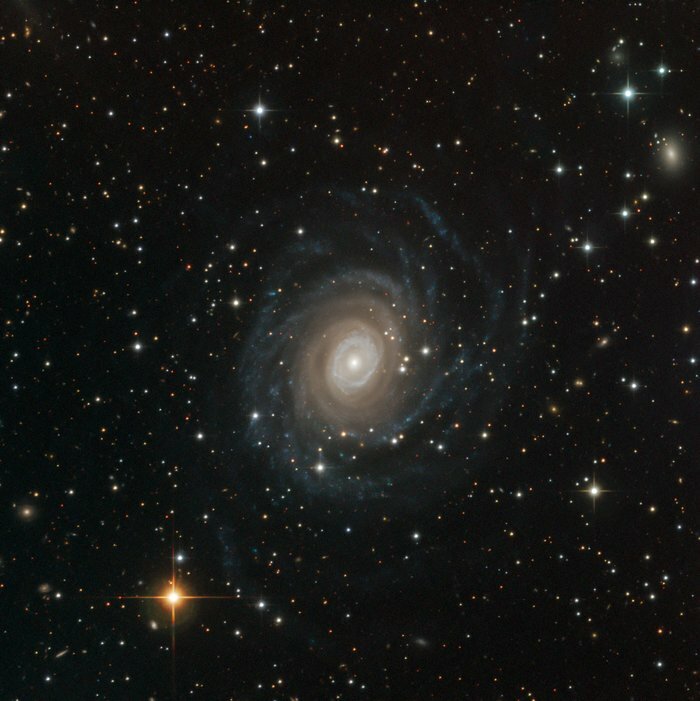 This image, however, is obviously not of a faint star, but of a galaxy called NGC 6902. Before a telescope starts its primary mission it must successfully undertake an event called “first light”: the first time it is used for a scientific observation. Astronomers typically pick well-known objects for this initial test of a telescope’s capabilities, which is half demonstration and half celebration. In this case, the team settled on NGC 6902 as the first-light target for the Ganymede telescope. The result was this stunning image of the spiral galaxy, which is found about 120 million light-years from Earth in the constellation of Sagittarius (The Archer). The galaxy’s spiral arms swirl outwards from a bright centre until they dissolve into streams of blue haze at the galaxy’s edge. If this is what Ganymede can produce as its first observation of something it wasn’t even designed to image, we have a lot to look forward to. Watch this space!